A diferencia de otros países y regiones con yacimientos de sal gema, la obtención de sal en Andalucía se ha sustentado en técnicas de evaporación. La sal y las salinas, aunque ya no son tan comunes y características en la franja litoral de Andalucía y en algunas zonas del interior, son todavía los elementos esenciales de la fisonomía de la mayoría de nuestros paisajes y de la memoria cultural de sus habitantes, por lo que siguen presentes de alguna forma en nuestro territorio a pesar de que casi todas aquellas explotaciones salineras, antes florecientes se encuentren hoy en día, transformadas o abandonadas. El litoral atlántico andaluz comprende las provincias de Huelva, Cádiz y Sevilla. Andalucía es una región de gran riqueza natural, cultural y paisajística. Además, es uno de los territorios europeos con mayor superficie protegida. Sin embargo, hay que indicar que nos consta la existencia de más salinas en activo en Andalucía, pero no se encuentran inscritas en el Registro Minero. Fuente: Instituto Nacional de Estadística, 2009. The Marais Vendéen Ecomuseum (46.875306, -2.101096) is situated in the commune of Barre-de-Monts, in the municipality of Vendée (France). It is managed by the Communauté de communes Océan-Marais de Monts, which includes five municipalities (Saint-Jean-de-Monts Notre-Dame-de-Monts, La Barre-de-Monts, Soullans, Le Perrier). Its field of action covers part of the Marais Breton located in Vendée. The Marais Breton is a wetland (polders and wet meadows crossed by ditches and canals) which spans 45,000 ha (111,197 acres). Originally, this area was part of an ancient bay covered by the ocean (Bay of Brittany). During the middle-ages the population built dykes and canals to convert it into salt works. From the fifteenth to the eighteenth century, the Marais Breton was one of the largest salt producers in France. This salt was mainly exported to the Nordic countries. This production area has been progressively abandoned in favour of the salt works of the south. Agriculture has become more important than salt production as an activity, which resulted in a conversion of hydraulic management (removal of salt water into the sea, gradually replacing it with rainwater). The abandoned salt pans are still visible on the landscape, however many were converted into fishing tanks. In the last fifteen years the activity of salt production has undergone a rebirth, particularly in the communes of Bourgneuf-en-Retz, Bouin and Beauvoir-sur-Mer. In Barre-de-Monts, the Daviaud salt works is the only productive one, with around fifteen active salt-makers. The ecomuseum is an open space, in which 37 acres can be visited. In these 37 acres one can find buildings which are representative of local architecture: farms, bourrines (traditional houses of the Marais Breton) salorge (traditional salt warehouses) ... These buildings have been preserved in situ or removed and remounted on the site, in an attempt to preserve this architectural heritage. Exhibitions, reconstructions of interiors, audio-visual projections, which allow the visitor to understand the history and evolution of lifestyles on the salt works, are presented in them. Since 1998, the ecomuseum has developed a research program on the flora and fauna of the Marais Vendéen. There is an ongoing partnership with university research laboratories. The ecomuseum is a prime location to study the fauna and flora, as it is situated in the centre of 185 acres of Espaces Naturels Sensibles (a measure for the protection of the environment) which manages it. The research undertaken so far has allowed for the implementation of a permanent exhibition, temporary exhibitions, specific functions and events involving nature. The Ecomusee du Marais Vendéen has the "Musée de France" certification. This certification, granted by the French government recognizes the national interest of the collections and the actions taken by the ecomuseum as benefitting this heritage. The Eco-museum has a collection of nearly 2500 ethnographic objects. In addition to objects, the ecomuseum restores or conserves buildings and specific activities of the region like le marais salant du Daviaud. Apart from visiting the site (consisting of about ten buildings) the ecomuseum puts on temporary exhibitions on the history, lifestyles and economic activities involving salt every year (in 2009, an exhibition was devoted to the activity of salt-making in the Marais Vendéen, and a film was produced on the same subject). Some activities for visitors were also devised, especially for the school-going public. Close to the Ferme de Daviaud (the main building of the ecomuseum) an old salt works was reactivated. This salt works, connected to the Ferme de Daviaud, was working until 1917 and was again put into operation by the ecomuseum in 1987, with the aim of preserving in situ the expertise of the salt-makers of the Marais Vendéen. This artisanal salt works has 10 pans (collection area). It produces ten tons of course salt and a ton of fleur de sel each summer. The salt works is owned by the site, but is managed through an agreement with the ecomuseum by an independent salt worker. The salt pans of the island of Ré (46 ° 13 'N, 01 ° 27' W) are located north of the island of Ré and cover the territory of five communes: Les Portes en Ré, Saint Clément des baleines, Ars en Ré La Couarde sur mer and Loix. The salt pans cover an area of 1,560 ha, i.e. 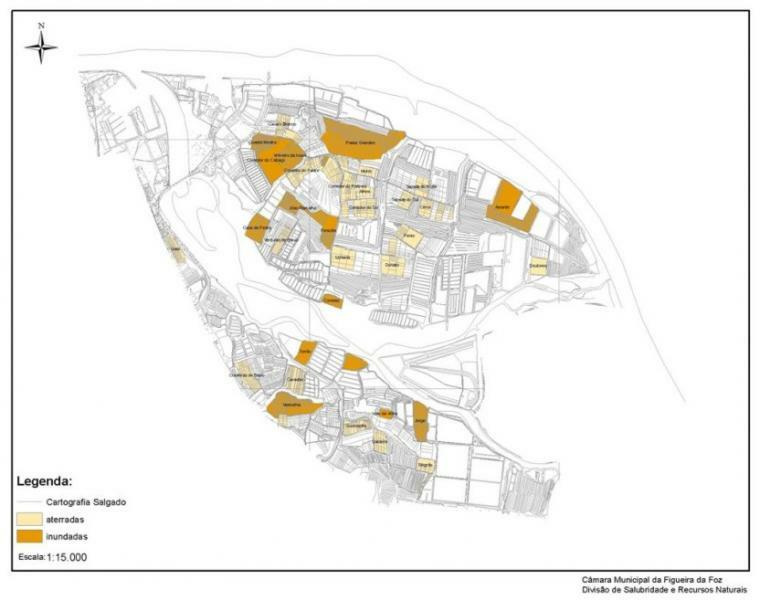 18% of the island of Ré, the water surface is 1070 ha, ranging between productive and unproductive areas. The salt pans were built on land reclaimed from the sea by means of dams, called prises. Currently, 460 ha are still exploited through artisanal sea salt production. The other salt pans were adapted for oyster farming and aquaculture (243 ha), for the preservation of nature - Réserve Naturelle de l'au Illeau Niges, reserves of biotypes - (80 ha), or even for hunting or recreational aquaculture (136 ha). A large part of the salt marshes is still unexplored. The site of the salt works of the island of Ré is part of the RAMSAR list. The salt works of the island of Ré are part of Natura 2000 network (Nomenclature Natura 2000: 1140, 1210, 1310, 1320.1330, 1420, 2190, 1410, 6510). There are two main modes of exploitation of the salt works: salt extraction and oyster farming. Table 1 - Surface occupied according to the different uses. Annual production is 2,500 tons, on average. One hundred farms produce sea salt and fleur de sel between 15 June and 30 September. The Marais Salant de la Prise de la Lasse is owned by the Conservatoire du Littoral and houses the sea salt ecomuseum, which, besides studying salt production, aims to provide the public with knowledge of salt production and the interpretation of the region. Its purpose, apart from artisanal salt production, is to make the practice of salt production known for educational, cultural and environmental reasons. The municipality of Rio Maior is located in a transition area where the influences of Ribatejo and Estremadura are mixed, creating an original space. 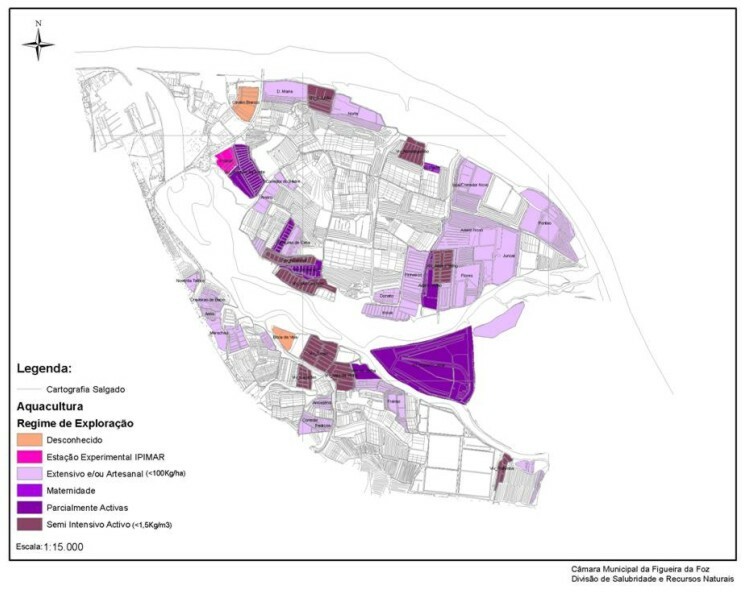 Administratively it is part of the Santarém district and is integrated in the Tourism of Lisboa and Vale do Tejo. Rio Maior is situated in the centre of Portugal, 75 km away from Lisbon, 30 km from Santarém and 20 km from Caldas da Rainha, with good access to both North and south. The North region is part of the Natural Park of Serras d´Aire e Candeeiros where the salt-pans are included. The salt-pans can be found 3 km away from Rio Maior, in a valley at the bottom of Candeeiros Mountain. Surrounded by trees, vineyards and other cultivated lands are considered a natural wonder, once the sea is about 30 km. The whole presents like a tiny village with streets of stone and wooden houses, where some curious tanks of irregular sizes and shapes can be found. In spring these tanks are full with salt water giving origin to white pyramids of salt. The oldest document referring to the Salinas dates back to 1177, but it is believed that salt was already explored in Pre-historic times. Candeeiros is a limestone mountain region with many fissures in the rock, which enables the rain water to penetrate forming undercurrents. One of these undercurrents passes across a very extensive and deep rock-salt mine and feeds the well in the centre of the pans. This water is seven times saltier then the sea water. This rock-salt occupies the region of the Portuguese Estremadura, between Leiria and Torres Vedras (about 100 km). It was formed millions of years ago. In old times the water was taken, day and night, by the means of two buckets, attached to two wooden rods. That was then the most hard work of salt extraction. Nowadays the salt water is taken from the well by means of a motor-pump which takes it to the “concentrators”. These are eight tanks with a capacity for a million litres through which the water passes and evaporates. This is a recent process. The water, already concentrated, goes back to a distribution basin, which stands by the well, and there continues to the pans. The well from where the water is extracted, is common property. The right to the water depends upon the proximity to the well according to rules whose origins are lost in time. Once the water is inside the pans the evaporating process takes about three to six days, depending on the heat. This means that each pan produces salt weekly. The salt is put together with iron shovels (once wooden) and put to dry on a threshing floor (Eira) for sixty hours. Afterwards it is taken on a wheel-barrow or in sacks to the machine (dumper) which takes it to the cooperative wooden houses or to the wooden houses of the private workers. The salt is grinded, or not, according to the industry it is meant for. Not taking any chemical treatment it’s purity comes from the Sun and the wind and the work of the sailor. In a recent past most of the salt producers were farmers, who dedicate to this activity from June to September. The profits are divided fifty-fifty between the owner of the pan and the Sailor (salt workers). Nowadays a team of workers are contracted by the cooperative society to make the exploration of the salt-pans. They are a living museum where throughout the 8 centuries of history the methods of exploring the salt have little changed, which gives the place its peculiar character. However, the demand for an ever growing industry leads to a constant progress and innovation on the techniques used by the workers. The challenge is to adapt to a competitive economy and simultaneously preserve this unique patrimony. In 1979 the Cooperative Society of the Salt Producers of Rio Maior was created to improve productivity and marketing of the salt. This purely biological salt is exported to Germany because of its high quality and the absence of any additives or chemical treatments. Fleur de sel - "Flower of salt" is a hand-harvested salt collected by workers who scrape only the top layer of salt before it sinks to the bottom of salt pans. Due to its quality and relative scarcity, Fleur de sel is one of the more expensive salts. The salt is given the shape of a cheese and it is heated to dry in an oven. They can be kept as souvenirs or used to season the food. Wooden houses were used to store the salt. They are currently being used for commerce once the salt is now stored in the cooperative facilities. Wood was chosen to avoid corrosion. The exterior side supports are olive tree logs. The key is the smaller piece. It is pressed up releasing the bolt. There are no two keys alike. These rulers were used to write down the expense done by each worker in the tavern which was established in a wooden house during the season. They were about 150 cm long and 15 cm large. Conventional symbols were used, each representing a drink and its price. Payments were made with salt. Some rulers can still be seen hung on the wall at the café. The Salgado da Figueira da Foz (Latitude: 40 ° 8 '48''Longitude: 8 º 51' 24'') contains the distal sector of the estuary of the Mondego river as central geographical unit, where the Island of Morraceira stands out. It encompasses the parishes of St. Peter Vila Verde and Lavos.. The Island of Morraceira (from morraça - cordgrass) is located at the mouth of the Rio Mondego. This estuary has an area of 3.4 km2, an average depth of about 2 meters and a typical depth of about 4 meters, in the subtidal areas – out of tidal influence. In this area the river divides into two, surrounding the island with silt. 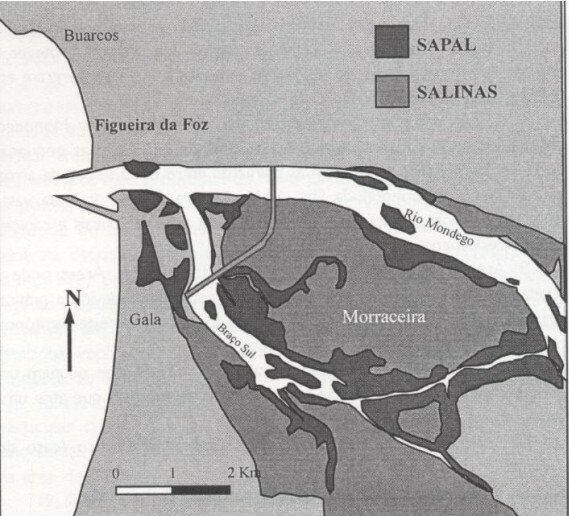 These two arms (north and south) come together again at about 1 km from the mouth, opposite the city of Figueira da Foz This deposition of alluvial sediments (sand and mud) in the downstream zone of the estuary has led to the formation of the Morraceira island, which is about 1,482 acres, separating the two river arms. This island includes appreciable extensions of marshes, reeds, rushes, salt works and aquaculture or fish farms. Fig. 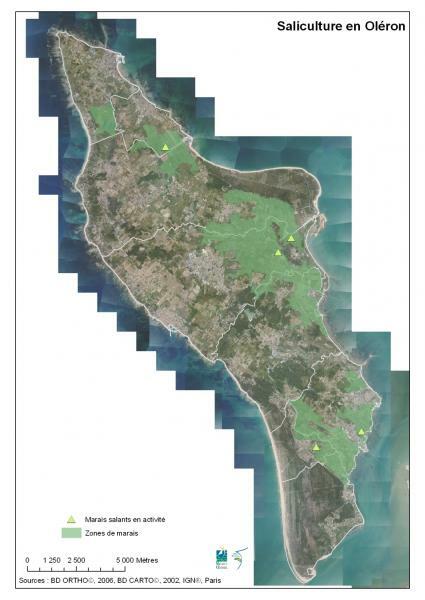 1 – Sketch of the distribution of areas of salt marsh and salt pans of the Mondego estuary, according to the distribution chart of biotypes by Marques et al. 1984. The exploitation of salt in the Mondego estuary was one of the main economic activities of Figueira da Foz. The type of salt pans and production techniques practiced in this salt works has specificities that cannot be seen in any other salt-producing region of Portugal or Europe. Its technical craft, which is extremely careful and well adapted to the environment, has survived to the present day. 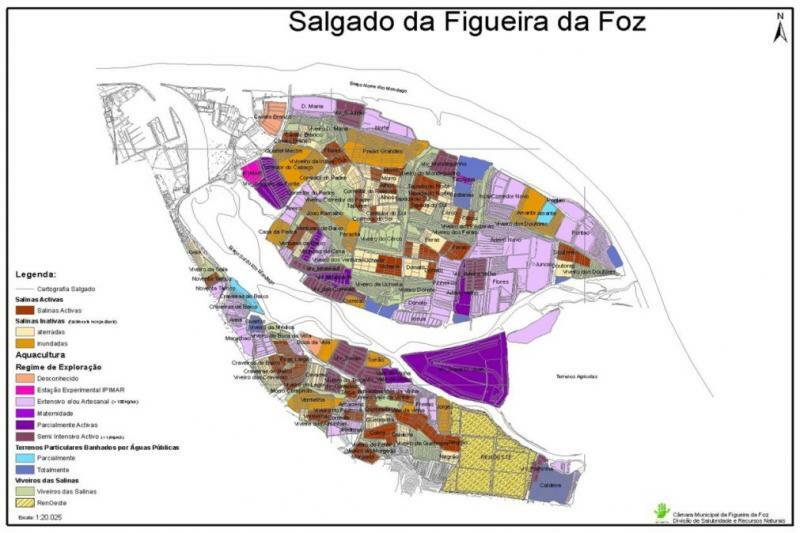 In the middle of the 20th century, the salt works of Figueira da Foz had a total of 229 salt pans, distributed on the Ilha da Morraceira (141 salt pans on a 1,282 acres surface), the left bank of the South Arm and Ínsua D. José (71 salt pans occupying a surface of 615 acres) and on the right bank of the North Arm (17 salt pans occupying about 74 acres). It is to be noted that 212 acres are navigable at all tides, 155 in half tide and 148 only in spring tides, there are still 20 salt pans that can be served only by land. Fig. 2 – Location of salt works (including nurseries) and major estuaries, taking into account the land register of 1954 (based on data adapted from L. Lopes, 1955). 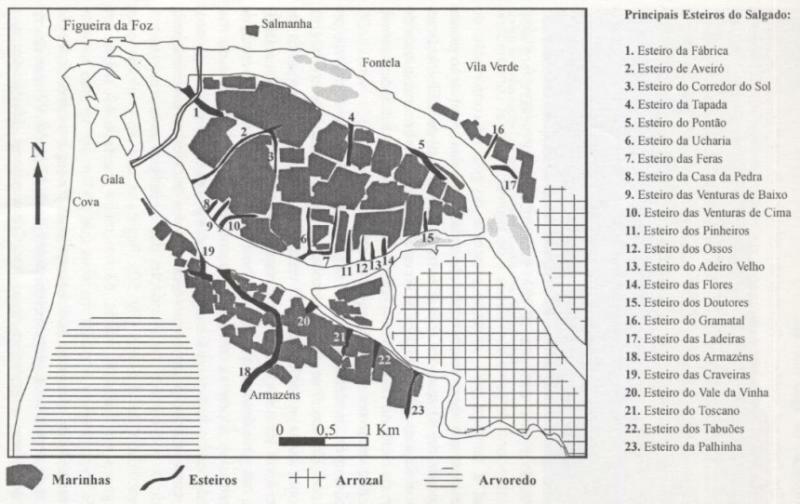 There is a change from circumstances in which salt represented the backbone of the activities of the estuary, directly involving hundreds of people - in the mid 20th century – there were 300 owners of and 1,300 workers, of which 500 were men (S . Dionisio, 1945) – to present conditions in which there are an estimated 40 to 50 salt pans functioning poorly. The salt works represent, in themselves, an extraordinary cultural legacy, beyond the value of the product that is extracted. Its internal organization, functioning and the specific work carried out by the marnoto (salt worker) are well worth further investigation. The sustainability of estuarine wetland has to include the maintenance of the salt-producing activities in traditional salt pans which, among many other positive functions, provide privileged locations in terms of landscape and biodiversity, with no negative environmental impact and even providing positive contributions to environmental quality. In this respect, we highlight the role of the exchange of sea water in the protected reservoirs, giving rise to large numbers of species of benthic macrofauna that are essential for the survival of many other species and are important resources for the local community. Fig. 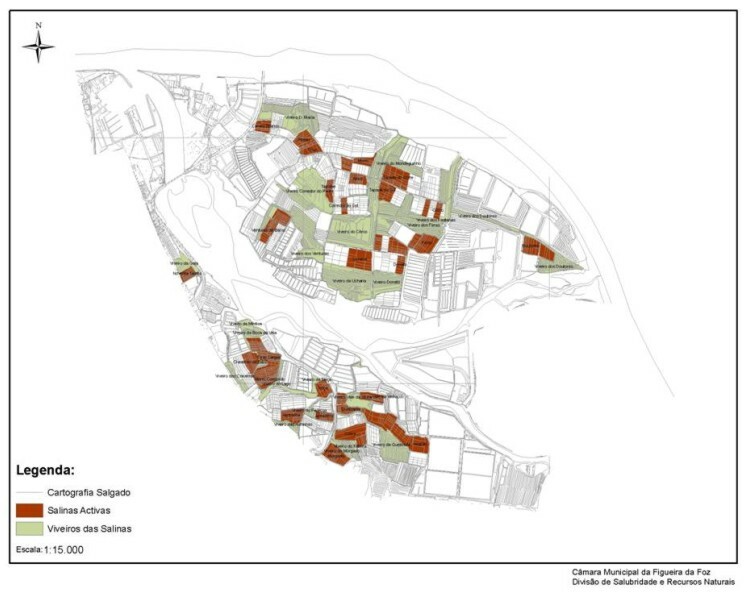 3– The territory of the salt works of Figueira da Foz - Salinas Activas (Active salt pans) (2003). The activ saltworks, and the second survey of 2003, constitute a total area of 588 acres. Filling a percentage of the current total surface (3597 acres) with a value of 16.3%. Fig. 4– The territory of the salt works: Inactive salt pans (2003). Inactive salt pans correspond to 387 acres, and there are 172 acres of land filled salt pans and 214 acres of flooded salt pans. Filling a percentage of the total current surface (3597 acres), with a value of 10.3%. Fig. 5– The territory of the salt works: occupied by aquaculture (2003). Filling a percentage of the total current surface (3597 acres), with a value of 23.4%. Fig. 6– The Salt works territory: data analysis. The Corredor da Cobra salt works is owned by the Municipality of Figueira da Foz, and has been considered an ecomuseum since 2000, the year that this municipal authority acquired it in order to transform it into a pilot centre and experimental unit of the Projecto Comunitário ALAS – All About Salt. Since then it has come a long way. This project represents, above all, an excellent example of an attempt to preserve and develop the salt works and their natural and cultural heritage, always keeping in mind the need to enhance the economic and social interests of the municipality. The implementation of this project represents the threshold of a new opportunity for artisanal salt production, in which there were many parallel activities and interests that created the need to seek new means and the funding of new projects. It was in this context that Projecto SAL do Atlântico emerged. The Corredor da Cobra salt works has contributed greatly to supporting this concept, paying particular attention to an integrated strategy that paved the way to maintaining salt production as an activity. Since the acquisition of the Municipal salt works, in 2000, the necessary structures were installed for the success of this initiative, which represents a good example in trying to preserve and sustainably develop a natural and cultural heritage that belongs to everyone and should be maintained, never forgetting the economic and social value related with it and without which it would not have such a vast importance. The salt works of the Corredor da Cobra has a total area of 29 acres, and has, at this moment, about 84 pans in production and is also working on the nursery and marsh, maintained during the fallow period (winter). The general concept of the salt museum site is based on the idea that the salt works and salt belong to an activity that integrates multiple aspects: historical, ethnographic, landscape, environmental and economic and should be explored in an integrated manner. Currently, on the other hand, the salt museum and other meaningful elements in the salt works areas are instruments helping to recover this activity and sites, and not just mere deposits of instruments and materials pertaining to salt. In the case of Figueira da Foz, the creation of a museum centre, in the middle of the salt works, is a remarkable added value, to which the existence of a warehouse and a pedestrian route lends significance. These allow the visitor to understand the integration of these three areas that complement and complete each other: the Corredor da Cobra salt works, the salt warehouse and the museum site. With the opening of the Salt Museum Site, The Municipality of Figueira da Foz intends to globally allocate an open space, an area for experimentation and the production of knowledge, that will structure new identities that form part of it, out of the different forms of relationship between Man, Society, Culture and Nature.In this sense, and by supporting an overall information strategy sustained, from the onset, in the reactivation and continuous maintenance of the salt exploitation activity, the Municipality sought also to provide the conditions for this salt works to act also as a training area for new marnotos, as the interpretive centre and laboratory for different studies in the biodiversity of this ecosystem type, and as a didactic unit for recreation and for interactivity to be enjoyed by the various different interest groups who visit this unique and distinctive place. Thus, the creation of a museum located in the middle of the salt works - and complemented by the existence of a salt warehouse, a pedestrian route through the salt works and a future River Route for the Mondego estuary - will allow the integrated enjoyment of different areas where one can explore the riches and complementarity of their contributions and meanings.